The tour of the Castel Nuovo begins in the 14th-century Palatine Chapel (or Chapel of Santa Barbara), which opens onto the 15th-century courtyard. Outside, the present-day marble portal, the work of Andrea dell'Aquila, replaced the Angevin portal in the 15th century, just as the rose window above, designed by the Catalan Matteo Forcimanya in 1470, replaced the 14th-century one which was destroyed by an earthquake. The interior has been restored to the canons of Gothic architecture after various changes made over the centuries, one of these was the 18th-century Baroque restoration. The chapel consists of a single nave with a wooden tie-beamed vault, with no side chapels, while at the end a rectangular apse opens into a high, wide single-lancet window which contrasts with the long, narrow ones in the side walls. In the 14th century, Giotto and his apprentices frescoed the entire chapel with stories from the Old and New Testament. Only small fragments of these remain in the window splays, with tiny decorative heads and plant motifs attributed to Maso di Banco and his collaborators; they have a suggestion of the Giotto frescoes of the Bardi Chapel in Santa Croce in Florence. The Chapel is the only remaining memory of the old Angevin palace, and contains works dating from the 14th century to the beginning of the 16th century. Among these are twenty frescoes(1360-1375) from the Castle of the Balzo di Casaluce, in the province of Caserta, from where they were removed in 1972 to be restored. 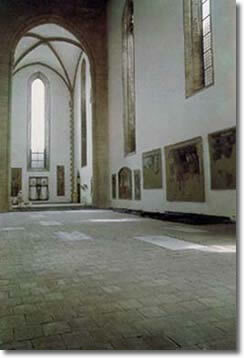 The frescoes on the right-hand wall of the chapel's single nave are the work of the Florentine painter Niccolò di Tommaso, an apprentice of Maso di Banco; next to a typically Masowork (S. Pietro Celestino sitting surrounded by the monks of his order) are motifs of Avignon-Gothic culture (Story of the life of the warrior saint Guglielmo di Gellone). 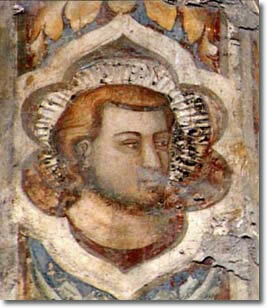 The frescoes on the left wall (Stories of the life of Christ and stories of S. Antonio Abate), have many missing patches and are of inferior quality compared to the others; they are by various Florentine artists of the second half of the 14th century. The Chapel and its annexed sacristy contains valuable Neapolitan Renaissance sculptures, almost all of them by the same artists who worked on Alfonso of Aragon's Arch of Triumph(1452-1458); worthy of note is the magnificent Tabernacle with Madonna and Child, an early masterpiece by the Lombard Domenico Gagini, a pupil of Donatello and Brunelleschi. On the wall at the end of the sacristy, replacing an eighteenth-century wooden wardrobe that has been transferred to the second floor of the museum, we note two Modanna and Childs by the Dalmatian Francesco Laurana, one of the greatest exponents of the 15th-century Neapolitan sculpture. One of these, called the Madonna of the Sparrow, comes from the Neapolitan Church of Sant'Agostino alla Zecca and dates back to Laurana's first visit to Naples; its style is quite similar to that of the sculptures made for Alfonso's Arch by the same artist. The other Madonna, a "sweet girl with a face shadowed by melancholy", comes from the portal of the Palatine Chapel and dates from the artist's second visit to Naples.